Automating a GUI test gets difficult whenever the SUT shows dynamic or unpredictable behavior, i.e. when it displays values that change with every run of the program. This is typically the case for fields that are filled automatically with things like the current time, an automatic ID from a database, etc. QF-Test addresses this issue with means to read values from the SUT's components or to determine the numerical index of a sub-item when given its name. These values are stored in variables to be used again later as the test proceeds. This node lets you read a value from the SUT during the execution of a test run. The text is assigned to the local or global variable (see chapter 7) named by the 'Variable name' attribute. Not all components display text and some complex components contain multiple textual items, so this operation is only supported for certain components or sub-items. If you try to fetch the text from the wrong component, an OperationNotSupportedException is thrown, while an unsupported sub-item leads to an UnexpectedIndexException. The following table lists the supported component and sub-item targets for this operation. (P/S) means primary/secondary index. Web In web applications every node could contain some text, so QF-Test returns either the text or an empty value, but never throws an OperationNotSupportedException. Execution: The data of the target component is sent to the SUT. 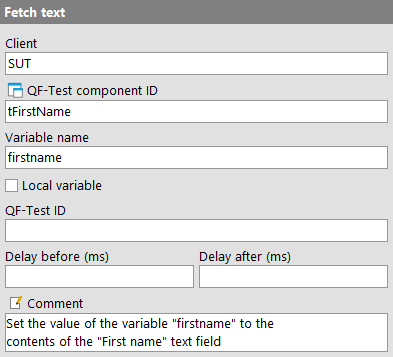 The TestEventQueue determines the corresponding component, retrieves the requested value and sends it back to QF-Test, where it is stored in a global variable. 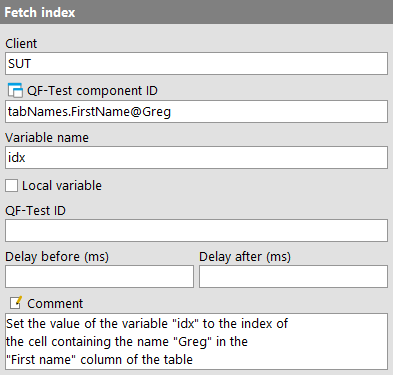 The name of the SUT client process from which to query the data. 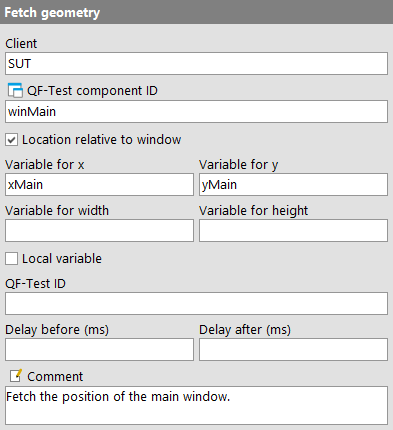 The 'QF-Test ID' of the 'Window', 'Component' or 'Item' node that is to be queried. The name of the global variable to which the result of the query is assigned (see chapter 7). With the help of this node you can determine the index of a sub-item during the execution of a test, provided its displayed text is known. Obviously only an 'Item' is supported as the target component. The result is assigned to the local or global variable (see chapter 7) named by the 'Variable name' attribute. Execution: The data of the target component is sent to the SUT. The TestEventQueue determines the corresponding component, searches for the requested sub-item and sends its index back to QF-Test, where it is stored in a global variable. Use this node to find out the geometry of a window, component or sub-item in the SUT. The result is stored in up to four local or global variables, one each for the X and Y coordinates, width and height. This node is useful if you want to set the 'X' and 'Y' coordinates of a 'Mouse event' relative to the right or bottom border of the target component. Simply fetch the component's width and height and define the coordinates using the extended variable syntax for expressions (see section 7.6). The following table lists the supported sub-item targets for this operation. (P/S) means primary/secondary index. Execution: The data of the target component is sent to the SUT. The TestEventQueue determines the corresponding component, retrieves its geometry and sends it back to QF-Test, where the values are stored in global variables. This attribute determines whether the X and Y coordinate of a component or sub-item is calculated relative to its parent component or relative to its parent window. For windows there is no difference. The name of the global variable to which the X coordinate of the window, component or sub-item is assigned (see chapter 7). If you are not interested in the X coordinate, leave this value empty. The name of the global variable to which the Y coordinate of the window, component or sub-item is assigned (see chapter 7). If you are not interested in the Y coordinate, leave this value empty. The name of the global variable to which the width of the window, component or sub-item is assigned (see chapter 7). If you are not interested in the width, leave this value empty. The name of the global variable to which the height of the window, component or sub-item is assigned (see chapter 7). If you are not interested in the height, leave this value empty.